151? There are only 150 psalms in the recognised canon. It depends on who you ask. Another text, not actually numbered 151 and a sort of annex to the collection, appeared in the Septuagint, an early (3rd C.) translation of Hebrew texts into Greek. Later, a copy was found in the Dead Sea Scrolls, indicating that it was probably in use by the community at Qumran and giving it greater credence today. However, by then the die was cast in the Catholic world. It was classified as apocryphal, although the Eastern Orthodox church accepts its authenticity. 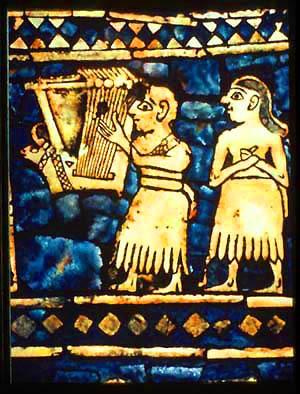 A lyrist on the Standard of Ur, believed to date to between 2600–2400 BCE. Image: Wikimedia commons, original from the British Library. This psalm is ascribed to David as his own composition (though it is outside the number), after he had fought in single combat with Goliath. 1 I was small among my brothers, and the youngest in my father’s house; I tended my father’s sheep. 2 My hands made a harp; my fingers fashioned a lyre. 3 And who will tell my Lord? The Lord himself; it is he who hears. 4 It was he who sent his messenger and took me from my father’s sheep, and anointed me with his anointing-oil. 5 My brothers were handsome and tall but the Lord was not pleased with them. 6 I went out to meet the Philistine and he cursed me by his idols. 7 But I drew his own sword; I beheaded him, and took away disgrace from the people of Israel. I must admit that I don’t hanker to include this in our repertoire of sung psalms; it appears to be more in the nature of narrative or oral history than of inspirational or spiritually enriching poetry.